Christmas is our favorite time of the year! This year is extra special because we have the opportunity to share a few of our favorite Christmas songs, both sacred and secular on our first ever Christmas CD. Recording this project was an exciting, unique, and very emotional experience. The birth of our Savior is not only a time for quiet reflection, but also for great joy and celebration. That's what we have strived to convey for this wonderful season. On her debut solo EP Rise, Molly reveals the scope of her diverse influences. Produced by Kai Welch (Abigail Washburn, Bobby Bare, Jr., the Greencards), the seven-song collection relies on a rock-solid bluegrass foundation as Molly breaks free without breaking ties, singing and exploring what her six-string acoustic guitar can do. She is literally the poster child for what Spotify considers "Indie Bluegrass" as the dominant streaming platform chose to feature her on their popular playlist of the same name. Her song "Lightning in a Jar" has over 1 million plays on the platform. Amid a non-stop touring schedule, The Infamous Stringdusters are announcing the release of their second covers EP; Undercover Vol. 2, an eclectic 5-track collection, will drop Friday, October 27 via Lumenhouse Recordings. The project pays homage to some of the band's favorite artists, including The Allman Brothers Band ("Jessica"), My Morning Jacket ("Golden"), Daft Punk ("Get Lucky"), Marvin Gaye ("What's Going On") and The Cure ("Just Like Heaven"), and continues in the spirit of honoring the music that has influenced them. Their 2015 Undercover EP included tracks from Bob Dylan, Tom Petty, Johnny Cash, Pink Floyd and Jimmy Webb. Charlottesville, VA -- Rebel Records is thrilled to announce today’s release of "What Does the Deep Sea Say," the first single from The Price Sisters' upcoming self-titled debut Rebel EP (REB-1860) which will be available August 26th. Consumers may purchase the song via iTunes and Amazon, or receive a free download of it by preordering the full album on iTunes. Asheville, NC -- Town Mountain independently released The Dead Session on Friday, November 13, 2015. “Each member of this band has enjoyed the music of the Grateful Dead for quite some time,” says vocalist and guitarist Robert Greer. “It seemed only fitting for Town Mountain to pay respect to some musical heroes in this year, their 50th year of existence.” The band recorded an impromptu set of two of their favorite songs from the Grateful Dead’s catalog at the widely acclaimed Echo Mountain Recording Studios in their hometown of Asheville, NC. With most of the Halloween candy reduced to wrappers, and the look on the pumpkin’s face beginning to droop slightly, the Holiday season has returned. Thanksgiving will be here before blood sugar levels have returned to normal which in turn means the glow of Christmas is already lighting the horizon. For the bluegrass band Urban Monroes, ‘tis a season stuffed full of meaning and joy, feelings that come out in flurries on their latest album release, a Christmas EP entitled Playing in the Snow. Punch Brothers are very excited to announce their new EP, The Wireless, which will be released on November 20 on Nonesuch Records! You can already pre-order now at www.PunchBrothers.com. You may recognize some of these songs from our live shows or from the bonus fourth side of the double vinyl release of The Phosphorescent Blues. Much like Ahoy! with Who's Feeling Young Now?, we recorded more than we could include on The Phosphorescent Blues so we're glad to be able to share the rest of these with you all. The 2014 nominee for the IBMA Momentum Award for Band of the Year, the Vickie Vaughn Band, announces their forthcoming EP produced by Grammy-winner Ronnie McCoury will be released Friday, September 25th. The Vickie Vaughn Band is set to release their debut six song EP. The funky yet traditional five piece band is lead by the big-voiced, bass playing western Kentucky native, Vickie Vaughn. Her band is stellar and well rounded with Justin Hiltner's innovative arch-top banjo styling, mandolinistCasey Cambell's blend of creativity and tradition, fast-fingered guitarist Zach Whiteand the tasty fiddling of Maggie White. The Vickie Vaughn Band, of which Jon Weisberger (Chairman of IBMA) named "among the most promising of the younger bluegrass acts around," is set to release their debut six song EP (produced by Grammy-winner Ronnie McCoury) on September 25. The funky yet traditional 5 piece band is lead by the big-voiced, bass playing western Kentucky native, Vickie Vaughn. Her band is stellar and well rounded with Justin Hiltner's innovative arch-top banjo styling, mandolinist Casey Cambell's blend of creativity and tradition, fast-fingered guitarist Zach White and the tasty fiddling of Maggie White. The new EP is here. Sleepy Man Banjo Boys released By My Side EP featuring 'Same Same Stars' The boys note, "We are excited to announce the release of our brand new EP, marking the first time we've contributed vocals to our original songs." Equal parts fast-paced and soulful, this slightly folk, slightly bluegrass 5-song EP by The Way Down Wanderers pulls listeners in with its originality and thoughtfulness. Analog recording, powerfully unique vocals, instrumental solos, lively dynamics and standout melodies make up the experience that is, The Way Down Wanderers debut album, Path to Follow. Out of Portland, Oregon comes The Heritage with a fresh new bluegrass sound. Their sound, with rich layers of acoustic instrumentation is topped off with a heartfelt female lead vocal, and dynamic harmonies. The band's original style falls within the bluegrass and alt-country genres. With their all-inclusive feel and memorable melodies, The Heritage caters to a wide audience of listeners. 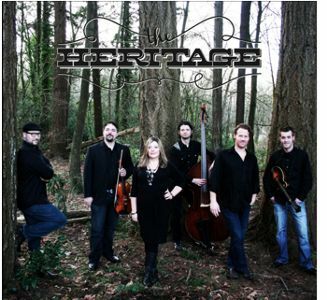 The Heritage has an EP out with 5 wonderful tracks of bluegrass and alt-country music.